We created this resource in response to a request we hear from teachers, instructors, and college professors that they would love to have more video from their students in their class work. We launched an extensive search for videos and clips of content on the internet that can be used both in class and by students at home. The videos range from news clips, documentaries, popular TV shows, to student projects, and represent many fields of study and areas of interest while a student..
Of course, we know there is always more out there. If you know of any video that would work for our site, or have any suggestions or comments, please send us a message. When this site was started, it began with lists of psychological disorders. 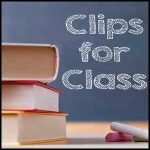 You will find lists of categories on Clips for Class. Click any of the categories in the list below to reveal a list of associated disorders, the title of relevant video(s), and a link to the section where you can find each video. Click the category again to hide the list of disorders. Lou Gherig’s disease – Charlie Rose – Stephen Hawking – Cognition > What is Cognition? Stroke – The Frontal Lobes: Cognition and Awareness – Cognition > What is Cognition?